Last week, the International Astronomical Union – the sanctioning body that oversees the naming of planets, among other things – reversed its official stance on 1) whether to bother naming extrasolar planets and 2) whether the public should be included in the naming process. 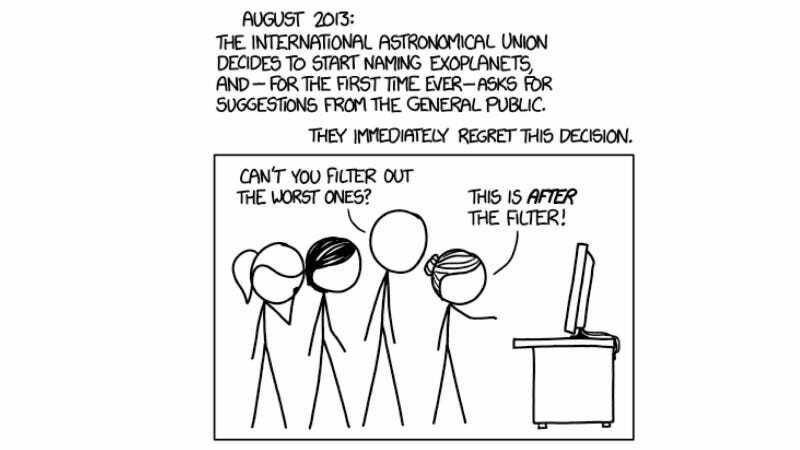 XKCD's take on the announcement is easily our favorite so far. You'll find more details on the IAU's new rules over at Universe Today, including why some astronomers say they're surprised at the notoriously stuffy* organization's democratic change of heart. *e.g. Referring to itself (in the organizational-equivalent of first-person) as "the official arbiter of planetary and satellite naming since its inception in 1919" in last week's announcement.